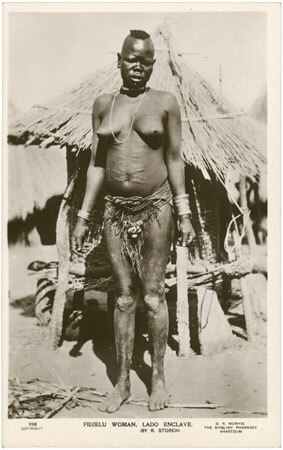 A full length full face postcard portrait of a Bari (Fajelu) woman with cicatrice designs on her abdomen and a pubic covering consisting of textile and fibre, with small bells at front. She is standing in front of a small granary. Notes on postcard - "396 Copyright. G.N. Morhig, The English Pharmacy, Khartoum. Fidjelu Woman, Lado Enclave. (By R. Storch)"
Morton, Chris. "Portrait of a Bari woman" Southern Sudan Project (in development). 03 Jan. 2006. Pitt Rivers Museum. <http://southernsudan.prm.ox.ac.uk/details/1998.88.46/>.